​By the end of the twentieth century, after hundreds of high energy experiments, mankind had deduced that all matter detected up to then in the laboratory is composed of three families (or three generations) of quarks and leptons. The first family containing the electron and three "colors" of "up" and "down" quarks, u and d, is sufficient to describe all stable atoms. The other two families existed in equilibrium with the first in the very early universe and are now recreated only briefly in the highest energy accelerators. They are, however, thought to have played an essential role in the development of the asymmetry between matter and anti-matter which allowed for the evolution of stars, planets, and life as the universe cooled after the big bang. Forces are mediated by the gauge bosons of the standard model. They consist of the "gluons" six of which cause horizontal transitions within each family among the three colors of quarks and the W's which cause vertical transitions. In addition two of the gluons as well as the photon and Z boson are "diagonal" in their couplings; they do not affect transitions between the quarks and leptons. The gauge forces of the standard model do not distinguish between the families and hence the primary question left unanswered by twentieth century physics is why there is such a range in masses among the quarks and leptons. The ratio of the top quark mass to the electron mass is about 300,000. The masses of particles in the standard model are proportional to the couplings of an as-yet undiscovered Higgs boson. The puzzle then becomes why there is such a great hierarchy in the Higgs couplings. There are now significant clues from the relative values of the strong and electroweak coupling constants and from the b/tau masses that a new symmetry known as Supersymmetry (SUSY) exists in nature. This theory, which has many aesthetic and theoretical advantages, predicts that for every particle in the standard model there exists a partner particle with the same quantum numbers except that its angular momentum differs from that of the standard model partner by 1/2 unit of Planck's constant. In exact SUSY the partners would also have the same mass but we know experimentally that this is not possible. Hence we are expecting to find in nature a broken supersymmetry where the SUSY partner particles are higher in mass. The standard model particles shown above are complemented then by SUSY particles as shown below. 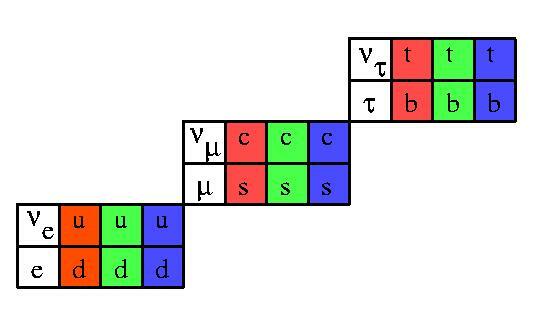 For each quark there should be a "squark" and for each lepton a "slepton". Also the force carriers have partner particles, gluinos, charginos, and neutralinos. One prediction of the minimal SUSY model is that there will be two Higgs particles accompanied by partner "Higgsinos". There will then be charged Higgs whereas, in the standard model, the Higgs was neutral. In addition the Higgsinos will mix with the partners of the electroweak gauge bosons so that there will be four charginos and four neutralinos. In exact Supersymmetry the partners should have the same masses which is experimentally excluded. We must look therefore for a "broken" supersymmetry in which the SUSY partners are higher in mass. There are reasons to believe however that these partners should not be higher than 1 TeV in mass and they should therefore be discovered early in the 21st century. This will then constitute a doubling of the known constituents of matter analogous to what happened in the twentieth century when anti-particles were discovered. There is still a possibility that the gluinos and photino of supersymmetry may be at relatively low mass (below that of the proton). Many experiments have been done that could have seen direct evidence for a light gluino. So far these have all turned up negative. To see the current map of gluino windows, i.e. allowed regions of gluino and squark masses not ruled out by experiment, click here.